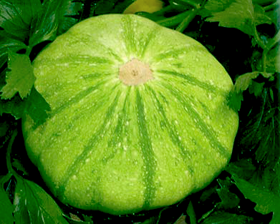 The vigorous Patty Pans type plants produce a delight green scalloped fruits about 300-400g. Distinctive, delicious, sweet flavor. Vigorous, early-bearing plants. Pick over a long period. Summer squash and zucchini ripen early and are highly productive. The bush type plants take little space. Sow seeds April to May 1cm deep indoors 3-4 weeks before last spring frost. Place in a propagator or warm place, and keep at a constant temperature of between 20-25°C. Germination will usually take 5-7 days. Can also be sown direct outdoors once the soil has warmed and all risk of frost has passed.